Burnbrae Farms, recognized as a leader by Canada’s food industry, has egg grading, processing and farming operations in 5 provinces across Canada. It has been privately owned and operated by the Hudson family since it was founded in Lyn, Ontario by Joseph Hudson, Margaret Hudson’s great grandfather, in 1891. 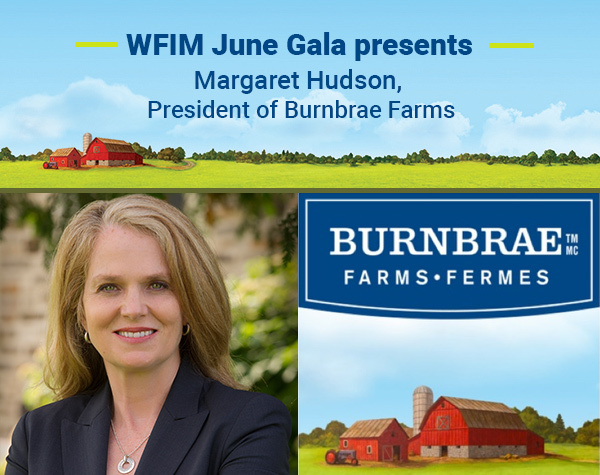 As the President of Burnbrae Farms, Margaret Hudson has gained experience in a variety of Burnbrae divisions in over 28 years of corporate work. The youngest daughter of company Chairman Joe Hudson, Margaret grew up in the business but has been working for the family firm full-time since 1990. Over this time period, Margaret has occupied a number of different roles within the company’s operations. Most notably, she helped to lead the development and launch of several award-winning products that appeal strongly to health conscious consumers including: Naturegg Omega 3 eggs and Simply Egg Whites. Burnbrae Farms now holds 13 Grand Prix New Product Awards, which recognize excellence in new product development in the Canadian food industry. Burnbrae is also recognized by the Best Managed Programs at the Platinum level. In her current role, Margaret overseas family and leadership team succession planning, strategy development and general operations for the company. A strong advocate for family nutrition and the promotion of the benefits of eggs to health-conscious consumers Canada, Margaret also sits on the boards of GSI, the Food and Consumer Products Council and the Royal Winter Fair.